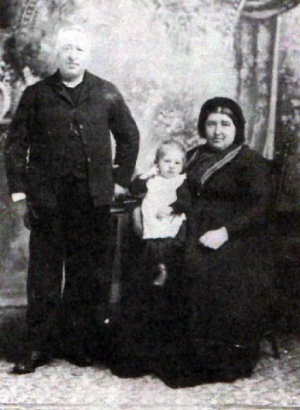 Katherina Hiebert with husband Jakob Hiebert and son Johann, ca 1896. Katherina Hiebert: Mennonite pioneer midwife and medical practitioner; born on 18 May 1855 in the village of Schönthal, Bergthal Colony, South Russia. She was the fourth of 11 children born to Abraham Hiebert (1827-1907) and Maria Falk (1829-1895). In February 1875 she married Jakob S. Hiebert (1833-1906), a widower with five small children who was 22 years older than her. During their 30-year marriage they had 11 children together, of which eight survived to adulthood. Katherina Hiebert died on 28 July 1916 at the age of 61. Katherina grew up in Schönthal, South Russia and was baptized on 20 May 1874. Five months after marrying she and her new family immigrated to Canada. They arrived in Ontario where they found work harvesting fruit until traveling to Manitoba in the fall. After surviving their first bitterly cold winter in Manitoba they built a house on land they had purchased in Schantzenfeld, Manitoba. Here they established a successful farm enterprise and raised their family. The Mennonite pioneers who settled in southern Manitoba during the 1870s faced many challenges. There was a great need in those early years for midwives and people with medical training. Katherina herself lost three stepchildren, three of her own children and a granddaughter. We do not know what kind of training Katherina had received in Russia but she possessed a real interest in helping the sick and took it upon herself to find ways of alleviating the suffering she saw around her. Katherina was intelligent and determined to learn as much as she could about treating disease and herbal medicines. She even ordered medical books from Germany as well as from a publisher in the United States. As a result she became the first midwife on the East Reserve and the surrounding settlements. Over the years Katherina delivered hundreds of babies, championed better health care for women, reset bones, worked to combat infectious diseases, did health teaching, and prepared bodies for burial. In her later years Katherina developed breast cancer which was successfully treated by an Indian woman using herbal poultices. Katherina could never convince the woman to reveal her recipe. In the end this forceful and determined woman developed diabetes and then had a stroke which left her partially paralyzed. Katherina Hiebert who had cared for so many during her life was nursed now by her youngest daughter Anna until her death on 28 July 1916. She left a legacy of years of selfless service to her family and community. After her death her practice and midwifery were carried on by two of her daughters, Maria Hiebert Penner (1876-1951) and Susanna Hiebert Hiebert (1885-1949). Neufeld, Regina Doerksen. "Katherina Hiebert (1855-1910): Midwife." Preservings No. 10, Part II (June 1997): 14-16. Brown, Sharon H. H. "Hiebert, Katherina (1855-1916)." Global Anabaptist Mennonite Encyclopedia Online. May 2006. Web. 21 Apr 2019. http://gameo.org/index.php?title=Hiebert,_Katherina_(1855-1916)&oldid=134639. Brown, Sharon H. H. (May 2006). Hiebert, Katherina (1855-1916). Global Anabaptist Mennonite Encyclopedia Online. Retrieved 21 April 2019, from http://gameo.org/index.php?title=Hiebert,_Katherina_(1855-1916)&oldid=134639. This page was last modified on 21 June 2016, at 23:46.